Ned Rozell | Geophysical Institute Aug 10, 2018. A snowshoe hare in Wiseman, Alaska. Photo by Ned Rozell. The evidence is in: Snowshoe hares near Wiseman eat lots of dirt. “I have thousands and thousands of photos of hares eating soil in this one little spot,” said Donna DiFolco, a biologist and cartographer with the National Park Service. DiFolco has studied hares in the eastern portion of Gates of the Arctic National Park since 1997. That’s when she started counting hare tracks near Wiseman as part of a lynx study. A few years after that, the hares disappeared, as did the many creatures that eat them. Since then, hares around Wiseman have started to boom, lynx have followed, and DiFolco, collaborating with UAF’s Knut Kielland, now uses GPS collars and trail cams. 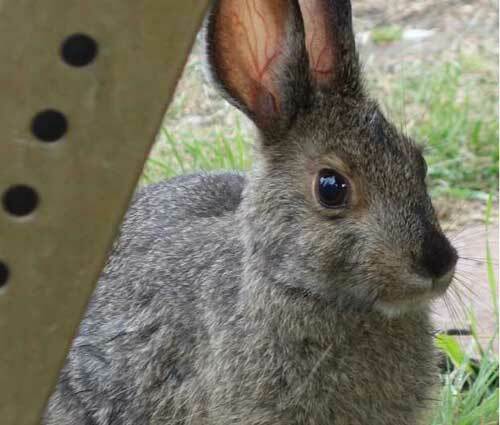 That newish technology helps her confirm what researchers have seen in the lab and Wiseman residents have noticed at river banks: Snowshoe hares are engaging in geophagy, and, unlike the lynx that eat them, they are probably better off for it. Geophagy is the word for a living creature eating soil. It’s unusual for people, except for pregnant women in Africa who buy it at open-air markets, but many wild animals visit mineral licks and chomp away. Years ago, Wiseman resident and naturalist Jack Reakoff mentioned to DiFolco and UAF biologist Knut Kielland that hares were beating a winter path to an exposed bluff on the Hammond River. With Reakoff’s help, the scientists have since mapped more than 40 mineral lick sites not far from Wiseman. DiFolco has deployed her trail cameras at a few of them. The cameras confirmed that hares were indeed eating soil, something Suzanne Worker also found in a Fairbanks lab. Worker, a graduate student who worked with Kielland, created discs of soil she got from the Hammond River and offered them to captive hares. She found that the ones that ate the soil seemed to eat more willow leaves and were able to maintain their weight better than those that didn’t. Why? The compounds in dirt may help hares offset chemical defenses plants produce to make themselves bitter or otherwise unpleasant. DiFolco has analyzed the area’s soils and vegetation to find the chemicals within. The white powder visible on the Hammond bluffs is a precipitate that contains almost pure magnesium. The bluff soil also has calcium and sodium. Eating it is like taking mineral supplement pills. “It’s better than what they get with vegetation,” DiFolco said. Hares that eat a lot of dirt might be more lethargic than those that don’t. Lynx that eat a lot of soil-eating hares can develop purple muscle tissue, Reakoff observed while trapping. “Lynx feeding on geophagic hares (on the Hammond River) may be . . . ingesting a dietary supplement of magnesium,” DiFolco wrote in a review paper. Those lynx might accumulate a slight overdose of heavy metals in their systems, which can leave them skinnier and less healthy, even in times like this, when hares in the Wiseman area are near peak population numbers. “(Wiseman resident) Heidi Schoppenhorst told me she saw 20 hares the other night on her drive home (from Coldfoot, 12 miles away),” DiFolco said. Snowshoe hare population explosions in the Wiseman area may happen every 20 years rather than the 10-year peak seen in other areas, according to Reakoff. “When the hares are up, we see everything,” DiFolco said. “I never see hawk owls when the hares aren’t around. Kielland and graduate student Claire Montgomerie have been live-trapping lynx in the area and monitoring their movements as part of a project involving great-horned owls, lynx, and the animal that enables the ecosystem, the snowshoe hare. Now that Wiseman-area hares are all over the place, DiFolco is glad she kept up with the study, even through the lean years. She now has a record of the important little creatures for the last 20-plus years and, even though she’s got a lot more to learn, is satisfying her curiosity of long ago, when she wondered why an animal might eat dirt.